Editor’s note: Brian P. Klein is an economic consultant and former U.S. diplomat who blogs at Klein’s Commentary. The views expressed are his own. The recently publicized series of State Department emails laying out in harrowing detail the attack on the U.S. consulate in Benghazi have provoked another round of finger-pointing and more politically-motivated pabulum. Ambassador Christopher Stevens and four other personnel, according to the same email, are at this time in the safe haven and the 17th of February Militia is providing security support. Based on this early assessment, it appears the situation is under control. Diplomats are safe. Armed entities are defending. Unfortunately, all was not under control, the compound was overrun, and Stevens died along with three other personnel. The spin machines have been busy politicizing this tragedy since its onset. The same Congress people that cut State security funding hauled up department officials to berate them over the lack of high security at the consulate (the same happened after the disastrous 1998 bombing of the U.S Embassy in Nairobi.) In the second presidential debate, Mitt Romney berated President Obama for taking so long to identify the attack not as an unruly mob, but the work of a specific terrorist organization (even though Obama did characterize the attack as an act of terror shortly after events unfolded). 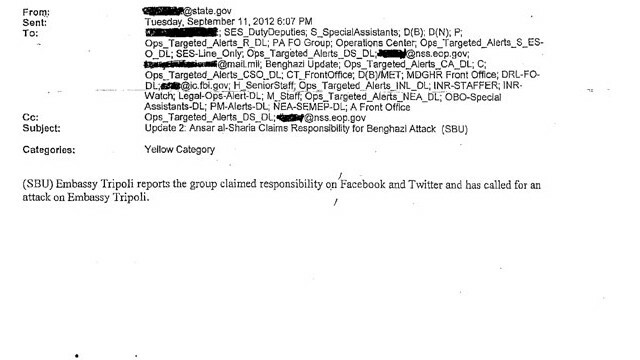 In another email released by CNN, Ansar Al-Sharia appeared to claim responsibility on Facebook and Twitter. Aha, go the conspiracy theorists, proof the administration knew but didn’t say anything for weeks. But no, actually, that doesn’t prove a thing. On any given day in the complex world of threat analysis, people and groups make all kinds of claims. It isn’t as if terrorists are holding a press conference for the world’s media to ask questions. Individual bits of information are simply that – single puzzle pieces that tell very little about the full picture of what happened until amassed and reconstructed. Details must be verified, cross-checked and analyzed before informed assertions are made. This very small selection of emails give the impression of control, but solid information is often hard to come by at the beginning of any situation that eventually transpires. No single account could immediately identify a specific attacker. Even establishing the facts of a traffic accident requires a police report and potential review by a judge or jury. It’s a process. An armed assault on a U.S. diplomatic mission, thousands of miles away, in a far flung province recently freed of civil war is an infinitely more complicated undertaking. It requires – indeed demands – time to assess and judge. There are ways to address the serious issues involved in the loss of our diplomatic personnel. Inquiries can and should be made. Did the rush to set up a presence in Benghazi trump normal security procedures? Why was a rosy picture being portrayed of a post-uprising Libya, when in fact serious threats remained. How critical was it to set up a new consulate in the first place? But using the attack in Benghazi as fodder for more November electioneering serves only the short-term interests of those who benefit by not giving the security of our diplomatic missions the thorough review (and funding) it requires. This does nothing to ensure the future security of our diplomatic personnel. They deserve better.